Elizabeth Zarzecki of Joy’s Hair Haven in Baltimore, Md., used a technique called foilizing. If you want to learn how to paint these bronze beauties, it’s easy. Elizabeth Zarzecki of Joy’s Hair Haven in Baltimore, Md., used a technique called foilizing. 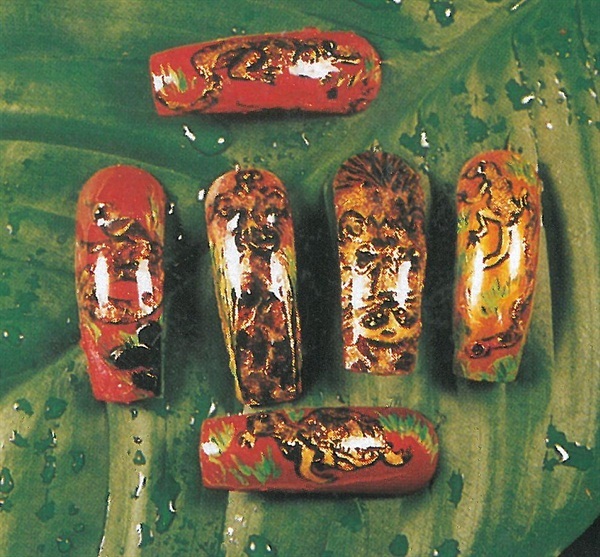 “Nail foil is made in many beautiful colors and designs and can be adhered to the nail,” says Zarzecki. All you do is paint over it! Zarzecki started by polishing the nails bronze; however, you can use gold if you wish. Then she painted the outline of the animals on the nails. She applied foil adhesive to the nail and let the adhesive dry. Zarzecki cut out a piece of the foil and pressed it firmly on the adhesive. Once the foil boned with the adhesive, she lifted off the excess foil. Then she painted the details of the animals on the foil with black and gold paint and used black and gold gems for the eyes. She added some greenery to give the design a “safari” look and sealed the design with foil bond.